Sorry for the double blog attack today, but I thought this one needs a post for itself. September is Childhood Cancers Awareness Month. I am not sure I ever really wrote much about how Vega was diagnosed? I guess in retrospective, and after hearing other parents’ stories about their children’s diagnoses, we found out relatively quickly. We took Vega to Kings A&E twice for foot pain, a month apart, and were sent away with ibuprofen. It was mainly due to my weird dream about Leukemia and I guess what can only be a mother’s intuition and my persistence that something is not right which is the reason why I went back to A&E again and we were diagnosed. Looking back at the six months leading up to Vega’s diagnosis, there were signs, but these were so small and seemed totally unrelated unless you would know what you are looking for. They day they told us in Kings that Vega is likely to have some sort of blood cancer, Leukemia of some kind, I felt totally numb. My eyes were so puffy from all the crying I could barely see the consultant who sat us down to discuss what would happen now. I remember asking if Vega would be ok- did we catch it early enough? The consultant then said to us not catching Leukemia early enough means the child would be dead and the cancer would be discovered postmortem. So yes, we caught it early enough. Leukemia does not have stages, as tumorous cancers have, because the cancer affects all the blood, it is not localised. The cancerous blood cells multiply, affecting the production of all other blood cells, taking space from the red cells and the platelets and untreated it is fatal in a relatively short space of time. I have since met many parents and many courageous children, all battling some sort of childhood cancer. Every one of them has a different diagnosis story to tell, but most could have benefited from an earlier diagnosis. I have linked to BE CHILD CANCER AWARE before, as this charity also runs the Beads of Courage program here in the UK. 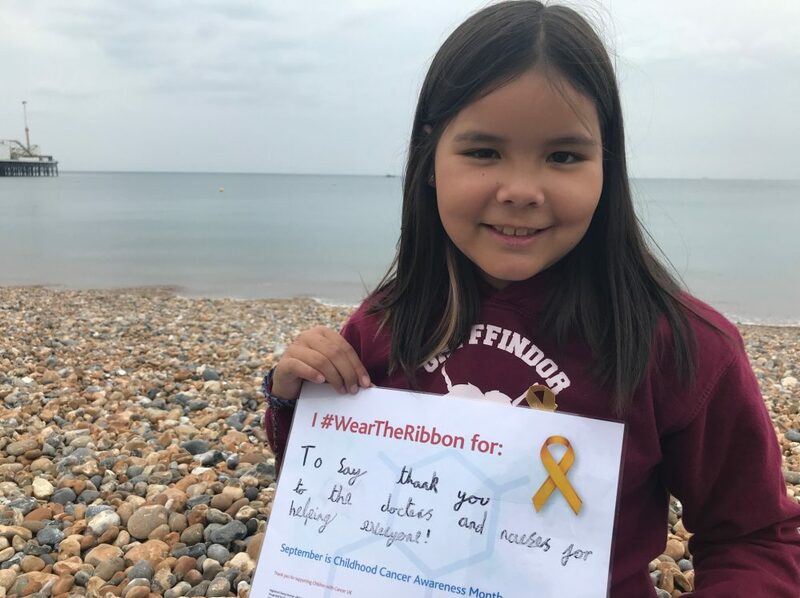 Their main goal is to raise awareness of the signs and symptoms of childhood cancers and to provide information to those families affected by cancer. 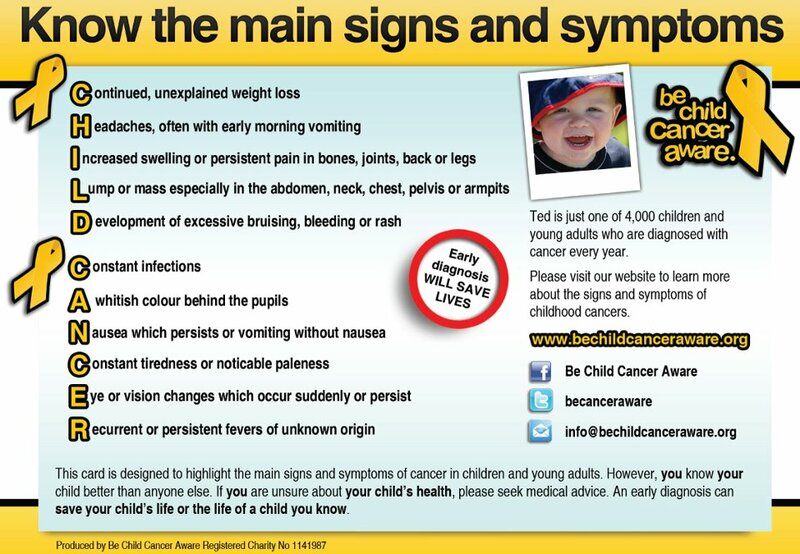 They have published an awareness card, outlining the most common signs and symptoms and work tirelessly to distribute these, in paper and as an online version. So why not this September, be more childhood cancer aware? You could do so by checking their website and making yourself more familiar with the signs of childhood cancer. It is indeed more common than I would have ever though. Become a friend on facebook, or follow on twitter. Or you could donate. To Be child cancer aware or to Ray who will be riding for the Marsden in two weeks time, or to me for walking the Shine half Marathon at the end of September or for any of my teammates. Or for any other Children’s cancer charity. There are a few links to choose from here on my blog. Awareness really does save lives and I for one am so so so grateful that Vega’s life was not lost to Leukemia, it goes without saying. This entry was posted in On Treatment and tagged be child cancer aware, beads of courage, Leukaemia by allvega. Bookmark the permalink.